Steel sheet pile construction avoids any structural risk because we do not lose any of its detail. Mainly to take into account the excess to ensure the normal operation of the entire project. In order to ensure the safety of the steel sheet pile in the process, It needs to be pre-tested during construction. How to detect it? This is the force of the steel industry today to share with you. From two aspects, the first appearance, then the material. Because we have some good steel sheet pile may have second-hand, the quality is also a big challenge. 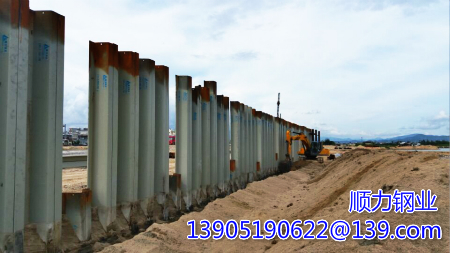 Because the sheet pile has a long service life, you need to look at all the sheet piles without any problems. 1, the surface of steel sheet pile defects, please confirm that you will need to clean up that part of the polished surface to remove defects such as rust defects. 2, the cutting surface of the two ends of the amendment, if you need to cut the end, be sure to keep the vertical rectangle, be sure to cut after grinding. 3, bending correction. This is a problem that many sheet piles can cause - bending deformation. This will be done using a professional bending tool. The fixed steel sheet pile uses the jack to deal with the deformed steel sheet pile by the cold bending technology . 4, need to be used for complete lock correction. Using the new steel sheet pile locking standard as the correction template, you can use the hoisting machine to slow down processing, or you can manually heat the knock correction.